Search for Extech EN100 - 11 in 1 Environmental Meter Complete with cheap and most complete prices contact: +628128384273, wa: +6281932632003 by Darmatek in kebayoran Selatan Jakarta. The EN100 is a Compact Hygro-Thermo-Anemometer with Light Sensor. 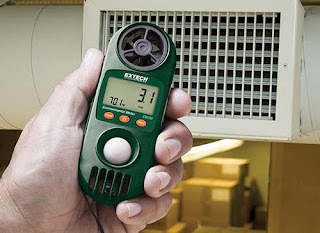 11-in-1 Environmental Meter Complete for indoor and outdoor conditions. Built in light sensor measures light level. Auto-rotating display depending on selected function. Also measures Air Velocity, Air Flow, Temperature, Humidity, Wet Bulb, Dew Point, Heat Index, Wind Chill, Barometric Pressure and Altitude. Complete with built-in multiparameter sensors, wrist strap, and CR2032 battery. Darmatek is an Extech EN100 - 11 in 1 Sales Online Shop for Environmental Meter Complete. We are here as a supplier of survey tools for land or buildings, instrument measuring instruments, telecommunication survey tools, geological survey tools or mining, and other survey tools including Total Station, Digital Theodolite, Automatic Level, GPS, Compass, Binoculars, Monocullars, Laser Rangefinders, Binoculars Night, Digital Altimeter, Clinometer, Tandem, Digital Planimeter, Distometer Speed Gun, Measuring Wheel, Measuring Tape, Grounding Tester, Handy Talky HT, Sound Level Meter, and Geological tools, PH Meters, Lux Meters, Anemometers, Thermohygrometers, Thermometers , Sirens, etc. Supported by brands that are well known and recognized in the survey world, including topcon, nikon, sokkia, garmin, trimble, magellan, suunto, horizon, bushnell, brunton, leica, bosch, south, yamayo, tajima, icom, kyoritsu, extech, lutron, yahagi, lion king, az, hach, sanfix, dekko, etc.